When an aircraft hangar catches fire things begin happening very quickly. Heat or flame sensors are triggered, the building is evacuated, and within seconds, many thousands of gallons of fire-fighting foam spreads throughout the structure to extinguish the flames. Designing systems capable of moving this amount of foam everywhere it needs to be across structures wider than the length of a football field is no small feat of engineering. FSB Senior Fire Protection Engineer Liane Ozmun said the first priority is always the safety of anyone inside, followed by protecting the hundreds of millions of dollars’ worth of aviation equipment typically housed within. 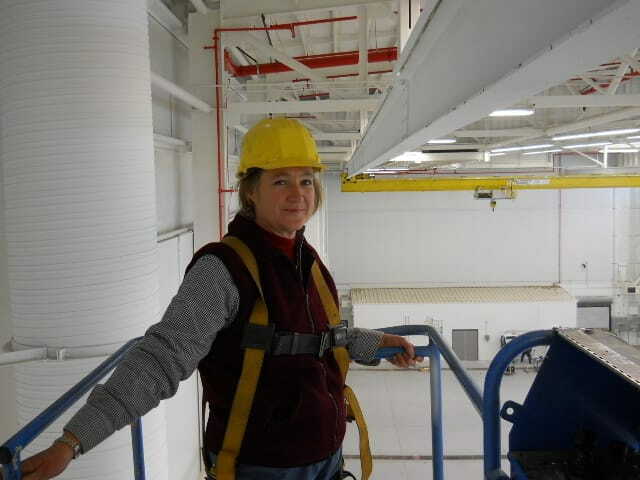 Clients appreciate the expertise Ozmun has developed in her 29 years at FSB — she has designed, modified and studied the fire protection systems for more than 100 hangars in that time, making her one of the nation’s foremost experts in her field. Beyond her design experience, Ozmun has played a major role in shaping the industry regionally and nationwide. For the past five years she has been a part of a national committee for the National Fire Protection Association, a group that helps set educational and professional codes and standards. She was also instrumental in the founding of the Oklahoma Chapter of the Society of Fire Protection Engineers. Ozmun’s experience and involvement within her industry benefits her clients. Whether the task calls for familiarity with detailed design criteria set by a United States Department of Defense agency, or an outside-of the-box solution for a major aircraft manufacturer like Airbus, Ozmun’s expertise and understanding of constantly changing design standards and requirements regularly saves FSB clients time and money. 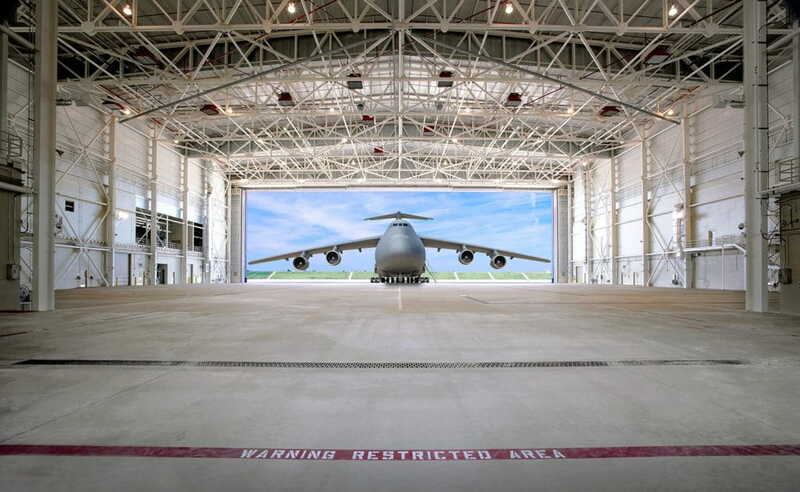 The Tennessee Air National Guard needed a maintenance hangar and fire protection for the largest plane in the Air Force. The C5 is a transport aircraft big enough to move tanks, troops or helicopters. Hangars for large aircraft like the C5 can be particularly challenging because their wings are so massive that they prevent large portions of the floor from being reached by the fire-suppressing high expansion foam distributed from overhead, especially when surrounded by massive work platforms. In fact, a fire protection system for this type of maintenance hangar had never worked fast enough to satisfy the requirements to cover 90 percent of the floor in under 60 seconds. “The hangar was so big that the foam needed to travel a long way through the piping system before it was released into the aircraft bay,” Ozmun said. To move the foam as quickly as possible, FSB worked with the contractor, who positioned the pipe diagonally across the hangar, the shortest possible distance. The fire protection system utilized high expansion foam which, once released, would swell horizontally beneath the plane, its wings and the maintenance platforms. Even the building materials were selected with fire protection in mind — Ozmun worked with the architect to select a very smooth concrete flooring within the hangar to help the high expansion foam move with less resistance across the floor. When tested, the fire protection system worked exactly as designed, filling the entire space with an expanding, fire suppressant foam faster than in any hangar of its kind. Ideally, the Air National Guard won’t need to use the system to extinguish a fire, Ozmun said. But, should an accident happen the hangar is equipped to save lives, and in this case, save a C5 transport aircraft worth hundreds of millions of taxpayer dollars. In the world of fire protection systems, all aircraft hangars are considered large-scale specialized engineering projects. The United Airlines Indianapolis Maintenance Center is in a class of its own, however. The site consists of seven separate hangars, totaling 1.7 million square feet. Ozmun said this “green field” site allowed the team to take a blank sheet of paper to sit down with the code authorities and insurance companies and start from scratch to design the ideal system for United Airlines. The sheer scale of the complex created an opportunity for some efficiencies in the fire protection system. The seven hangar structures shared one central water and foam supply, with tanks that stored two million gallons of water connected to each hangar via a 30” distribution loop. Each hangar was equipped with heat sensors that, when tripped, would signal the central supply to send foam to the affected hangar. Fire walls were constructed between some of the hangars to contain the fire and allow personnel from surrounding structures enough time to evacuate. It’s unusual for an architecture and engineering firm to have a strong fire protection team in-house. FSB has always considered fire protection systems an integral part of its hangar design capabilities, and with experience on more than 100 hangars, Ozmun and FSB’s other fire protection engineers have quite a bit of practice. Interested in learning more from the hangar fire protection experts, contact Laure Majors at busdev@fsb-ae.com or call her direct at 405.840.2931.